In 2005 I made my first trip to the Omo River Valley, and I have returned annually to document the lives of women in the remote valley as well as around Lake Turkana. Kara Women Speak is my ten-year multimedia project about the Omo River cultures from the women’s point of view, and the human rights and environmental issues that now threaten their way of life. This body of work tells their stories through portrait photography, recorded interviews, and field recordings of ambient sounds, social media, film and video. Over the course of the decade, I became intimately connected with the women of the Kara, Hamar, Kwegu, Nyangatom, Dassanech, Mursi, and Turkana communities who have lived for centuries unaffected by colonialism or modernity. Grave human rights abuses and environmental destruction now threaten their way of life. The Gibe III dam being built on the upper Omo River will forever change the flood cycles that deposit essential nutrient-rich silt along the riverbank that makes their land productive. The loss of annual deposits of silt-laden floodwaters and grazing land will create food shortages and increase tribal and intertribal conflict. These notes from the field represent my personal experiences and observations of a decade working with women and their communities in Ethiopia’s Omo River Valley and Kenya’s Lake Turkana. Indigenous Omo River cultures have been living self-sustainably for hundreds of years. They grow their own food, make their own clothes from the leathers of their goats, and forage wild fruits, seeds, and edible plants from the forest. They harvest honey from their beehives and gather medicinal plants. The Omo River provides fish and abundant water for their cattle, goats and agriculture. And they trade with other tribes for the few necessities they do not produce themselves. This self-sustaining lifestyle is rapidly changing, however. 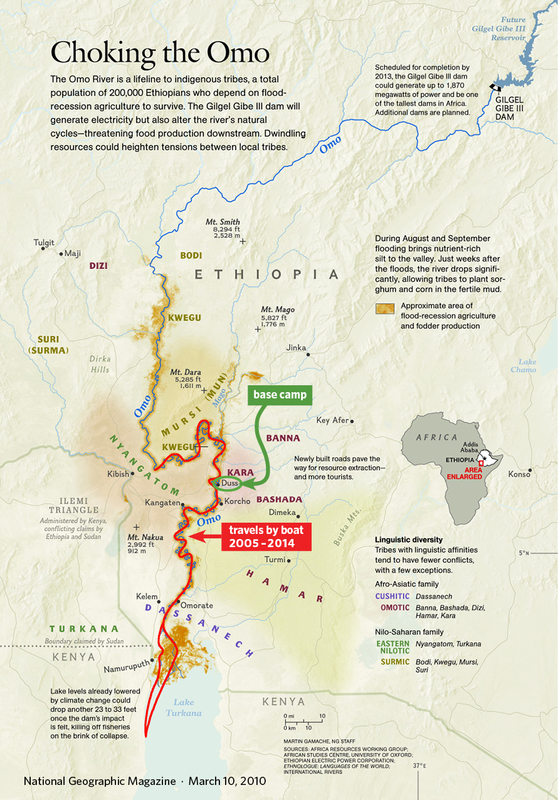 I returned from my latest trip to Ethiopia’s Omo River Valley on September 19, 2014. Since 2012, massive tracts of Kara ancestral forests and bush-land have been bulldozed and laid bare (photos on pp. 12–14). Land grabs are well under way. The Ethiopian Government has seized and leased thousands of hectares of land to the Omo Valley Farm Cooperative PLC, operated by a Turkish agri-business company to plant cotton – all without compensation or consultation with the Kara or other indigenous communities of the Omo River Valley. 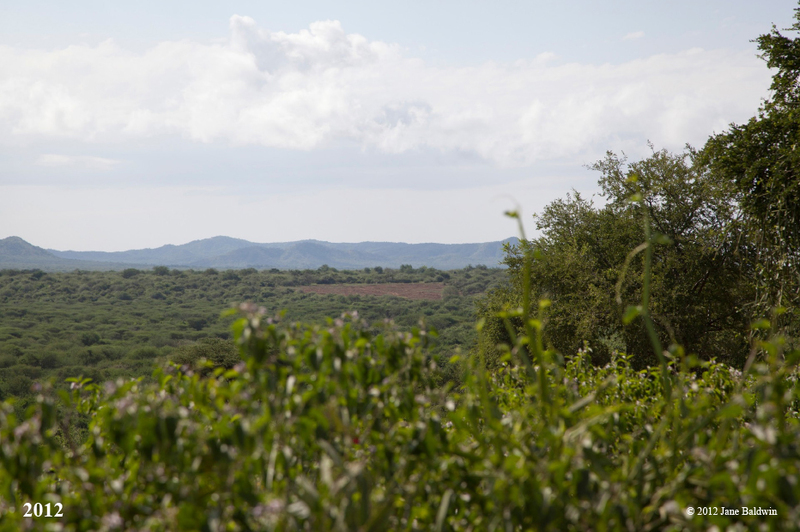 This is only one of many land leases going on in the Lower Omo. The Kara have been thoroughly marginalized by these changes. Thousands of hectares of Kara bush-land and forests, which supported their self-sufficient way of life, have been decimated. The valley is now a wasteland of ripped trees pushed into huge piles of brush and dead wood throughout the valley. All Kara villages are now squeezed between a huge cotton farm and the Omo River. 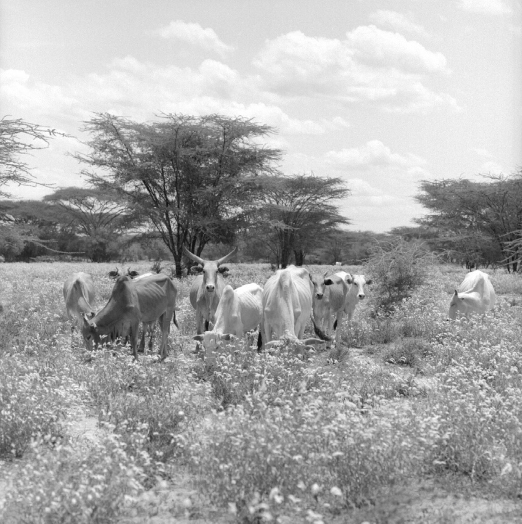 Their land is no longer available to graze their cattle, and they were forced to move about 4,000 head of cattle to the Mago National Park area, 30–40 km north of their villages. The people now have only a limited number of goats for milk and meat. Since most of their forests and lands have been decimated, the abundance of seasonal wild food to forage has become inadequate. The loss of wild fruits, nuts and honey and natural medicines is reaching crisis levels for many. The harmony and balance of the eco-system I first experienced from 2005–2012 has disappeared. I no longer hear the rich sounds of the natural world. Gone are the vocalizations of the Fish Eagle and Egyptian Ibis, Vervet monkeys, baboons, bees, and the night pulse and sounds of insects and frogs. One clear sign that this is a dramatically changed landscape is the unnatural quiet in what was once an area of rich soundscapes. All wild and natural landscapes around the world have a unique soundscape and each has its own distinctive signature expression. Every soundscape has three different layers of sounds that include insects, birds, mammals, reptiles, and amphibians, and each vocalize at its own specific sonic bandwidth. The huge changes to the Omo River eco-systems reveals how rapidly the balance and health of the Omo River Valley and Omo River have declined. The Kara women work hard to hold their communities together, and have always done the heavy work. They care for their children, carry water from the river, thresh the sorghum, gather wood for their fires, and still seem energetic, optimistic and proud. Land-grabs are deals that lack free, prior and informed consent by land-users, do not include socio-environmental impact assessments, and are carried out corruptly and without proper democratic participation. On my most recent trip, however, the women were noticeably tired and thinner. Babies seemed to have more infections than in previous years. The women showed less pride than was so evident in past years. The men are losing their role within their culture and seem powerless to resist the takeover of their ancestral land. I’ve been told that Government people and “highlanders” drive down from the north to sell them Araki (a type of moonshine). Alcoholism is on the rise. The Ethiopian Government recently attempted to move a Hamar community off their land to make room for other transnational agri-business farms to plant cash crops of cotton, palm and sugarcane – all for export. All Omo River communities are at risk of such projects and face forced evictions and relocations. Villagization  has begun. The government built a small Hamar resettlement village, but the Hamar have refused to move into it. It now sits empty. In 2004, I joined four other women on a low-level flying expedition following the great rivers and waterways that define life in Africa. We flew over 5900 miles in a six seat Cessna 210 airplane, traveling from the Blue Nile’s source in Ethiopia to Cape Town, South Africa. It was on this trip I first heard about Ethiopia’s Omo River Valley. In 2005, I made my first trip to the Omo River Valley – considered to be the most culturally diverse region in Africa. I’ve returned annually. On this first trip, I drove from Jinka to Murelle to meet my guide. As I got out of the vehicle, my senses heightened and came alive with the scents in the air – scents that were potent and somehow familiar. These early visits to the Omo River Valley were intensely sensory and powerful. 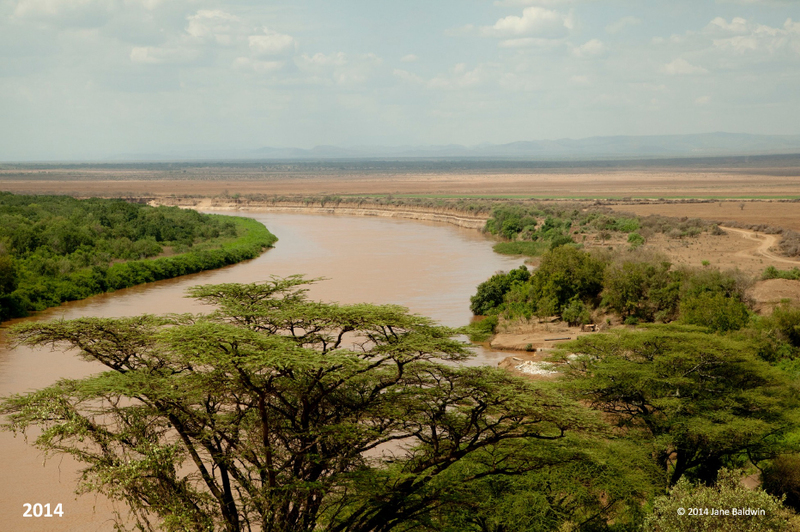 My camp was located on land overlooking the Omo River and shaded by magnificent Cape Mahogany trees. Time took on another dimension. There was a rhythm to the land that became almost palpable. The smells, scents and ambient sounds of the natural world seemed to define ‘time.’ At dusk, as the sun faded and as the land cooled, the scent of the river and air took on the smell of tannins, much like musky tea. Western time was no longer relevant. I took off my watch. The ambient sounds of the day and night marked the passage of time. After dusk the vocalizations of insects and frogs softly filled the air accompanied by the occasional grunt of a mother Nile crocodile calling her young. Early in the morning Colobus monkeys called to each other back and forth across the Omo. The Fish Eagle and Egyptian Ibis screeched as they began to feed. At sunrise and sunset African honeybees could be heard coming and going from their hives. In March 2010, when we landed at the Murelle bush airstrip, the land was in full flower and carpeted in white blossoms to the horizon. I’d never been to the Omo this time of year. The air smelled of honey and the cattle, goats and sheep grazed belly-high in the blooms of flowers and fresh grass. The next morning, as I sat next to my tent over looking the Omo, I felt an overwhelming reverence for the land and people. Thousands of white butterflies were everywhere; the air smelled sweet and honeybees could be heard leaving their hive. I was immersed in the surreal beauty of the natural world that seemed to transcend reality – a place one only reads about in literature – and imagines. This was an ecosystem in perfect harmony and balance. Omo River cultures are patriarchal. In these patriarchal societies women rarely have a voice and their stories often go untold. Women are the nurturers and sustainers of their communities and families. They are valued for the number of children they bear and for their hard work, but they are seldom engaged for their thoughts and ideas. Kara elders were often in camp and curious to connect with us. On my first trip, I noticed that when the Kara women came into camp they’d linger in the background. One day I approached them and we began to sit together, finding ways other than a common language to communicate. I wanted to learn more and enlisted my guide and a young Hamar woman to translate for me. In 2009, I began to interview women and record their cultural stories and their role within it. They were eager to talk about their lives and their concerns for the future of their people. Women are the heartbeat of all Omo cultures, but rarely have an opportunity to express their opinions. They are keepers of their oral traditions that pass down the narratives of their ancestry and families. Through this oral tradition of storytelling and song, they keep their cultural and family histories alive. Throughout my decade of travels in the region, I’ve gone by boat up and down the Omo to visit with women of indigenous villages. The Kwegu and Nyangatom are isolated and live on the Sudan side of the river. The Kara and Mursi were accessible on the east side of the river. The Dassanech live in the delta, a remote area of islands and marshes along the Kenyan border. The Turkana live around the shores of Kenya’s Lake Turkana, and the Omo River provides about 90% of the lake’s water. Without a boat, most of these villages would not have been accessible. During my ten years of travel along the Omo I never saw another boat except kouros, made from trees that the local men use to navigate the river. The Hamar were within a short day’s drive and on occasion, I’d sometimes camp overnight at a Hamar compound. Omo River cultures possess a highly sophisticated system of rainfed farming which allows their crops to thrive under often-difficult conditions. Their village seed banks contain different varieties of sorghum and peas. They have an intimate understanding of Omo River floods. Without access to their land, their food security and livelihoods are now in peril. Hundreds of thousands of people live in this watershed. They are at risk of eviction from their land; tribal and intertribal conflict will almost certainly worsen as diminishing resources disappear. Government people and contract farmers could also get pulled into the conflict. In September 2014, as I left the Omo River, it was clear to me that these cultures would soon be quashed by their government and outside influences. I don’t feel I can end this paper without reflecting on the global history of indigenous people. In this 21st century effort by governments and huge multinational corporations to acquire land and water rights throughout Ethiopia and Africa, history seems to be repeating itself. Conditions are being created that will bring about the physical and cultural decline of all indigenous Omo River Valley communities. I believe it’s only a matter of time before sickness and malnutrition permanently take root. The influx of massive farms is slowly wedging the Kara and other indigenous people up against the Omo River without any place for them to go. The reduced access to their ancestral land, their ability to be self- sustaining and provide for themselves is now endangered. If nothing changes, the people of the Omo will be scattered and their cultures will disappear. To be successful, how can long-term land leases by the Ethiopian government (or any government) to foreign corporations be sustainable without the participation of the local indigenous people? How does a government measure success? A Nyangatom elder recently said, “Don’t just think of today, but think of tomorrow, and the future’s future.” In the Omo Valley, it seems that tomorrow may be a much darker, more difficult place for the indigenous peoples. And the world will be a lesser place without these vibrant and resourceful cultures. As an artist with a deep connection to the Omo People, I hope my insights and personal experiences of this region can help illuminate the serious consequences facing these self- sufficient, vulnerable, proud and dignified people. These testimonies and stories from women give voice to people on the verge of displacement from their ancestral land and loss of cultural identity and way of life. The testimony of these women from Ethiopia’s Omo River Valley and Kenya’s Lake Turkana reveals their fears and the grave challenges they face. The devastation to the environment they depend upon for survival has already begun. International human rights and environmental laws are not being respected and are inflicting casualties on the voiceless. Here I present a sampling of stories from the women I have been interviewing over the past decade. We are busy with our own river working, planting sorghum and feeding ourselves. This river provides for us, the Omo People, like our mother’s milk for our children, is like our money and food. Without knowing us or talking to us, the government makes this decision to build dams and take our water. Without knowing us they continue doing their business and sell this river so they can feed and raise their children. What about us? Before the government finishes the dams they’d better come here and kill us Kara and other Omo people who depend on the Omo River so we won’t starve to death. Or, let us know when the dam is going in so we can kill ourselves rather than starve to death. Omo people need support. We depend on this river so wherever you go please tell people we need their support. Tell everyone. The Turkish farmer took almost all our cattle’s grazing land. We had a boundary agreement and he ignored our boundary. He is a crazy guy. He says he will continue ‘cleaning the land’ all the way to Labuk. No one listens to us. I went to see the dam along with other Omo people. It is huge. I was scared. The way I see it, there is no future for any people in the Omo River area. I asked government man a question, ‘When you planned this huge dam, did you consider the people down river?’ He is clever. He lied to us. He said, ‘No problem, we are ready to help you.’ We might not be educated, but we know what is happening. The water behind the dam is huge. I was really sad. There will be no water for us. When this river comes high it brings food for us. If we lose our river, no option, we will die. All the crocodiles and fish will die. Everything will die. in this village to talk to us about the damming of the Omo River. We worry about how we will survive. Fish stocks have gone down. We are just women who are surviving by the lake. We get our living from the lake to support our children. The lake provides to feed my children. The lake is now the father of my children. When I lost my husband I moved near the lake. Many women have lost their husbands and we come to the lake for our survival. All our food comes from the lake. Lake Turkana is a source of life for me and the Turkana people. If these waters get finished that is the end. Children will get sick because of lack of food and will begin just dying. God puts fish in the water for us to have life. Akudge, our God, he exists beyond the clouds and he provides. It’s the spiritual being of god that we get fish in the water. As a woman you visit women. I hope you will share with the world. Thank you, thank you for coming. We only have idea about the dam. Only that our lake is being closed. We know nothing more. Fish have started to go away and people are going hungry. Our cows and goats have started to die because no grass is growing along the lake’s edge. My family lives along the lake and when the lake goes down we suffer, and sometimes people die. The lake to me and my family means “river of life,’ it carries fish, water for our livestock. If there is no lake, no fish, there is no life. Nobody comes from the outside and talks to us. Nobody has come and discussed the issues from the government side. We only hear rumors. There are big changes on the riverside. We hear that people somewhere are going to block the river, but we don’t know where these people are. We are waiting for the river to flood. We need the river to flood so we can plant our sorghum to feed our children. If this river continues going down, down, we have no more life. If we can’t plant sorghum we will die. Government people want to give our Hamar land to other people to make big farms. The government built houses for us Hamar to move into. We went to look at the houses and we refused to move. Why we move off our own land? We want to stay with our own culture. We are not happy about what government is doing with Omo people’s land. Me, I am sad. This river, when it is high, brings food for us. Things are not as they have been before. There are now many water pumps. God created this river to feed us, and the Government people came and gave our land to other people. When they came to take our Omo land, we all together decided not to let them. There was a fight and two people died. Not Dassanech. I have one question for you – what I’m asking is – is this river, where we plant our food, where we catch our fish, will this continue or will we loose this farming land and water in the future? If you know will you share with me? We have no say. Nobody comes and explain to us. We have no future. is coming up. The river is food for us. We get our water from the river. We get our fish and crocodiles from the river. We eat crocodiles and their eggs. If the government and highlander people plant their sugarcane, where will we get grass for our cattle to graze? No one from the government comes to talk with us. We hear from educated Nyangatom. They hear it on the radio. If we are forced to go to another tribe’s land, it will be big problem. We would rather die on our own land. I am happy you are asking me these questions about the dams and sugarcane. Look at this forest with big trees on both sides of the river. This forest helps us to feed our children. In our culture, wherever we go we eat for free. When we go inside the forest we find many things to eat – seeds, fruit, beans, honey, special medicines. If the government comes and they start planting sugarcane along the river and, they take our water, what do we do? Where do we get our water? Where do our goats and cattle get water? Where do we plant our sorghum? All these foods we get from the forest, the fish from the river, where do we go to collect our fruits and seeds if the forest is gone? Where do we buy these things? How do we feed ourselves? These things are very complicated for us. People of our village and other villages, we don’t want to lose this river, to lose our land, our forests. This is our original place. What would you think if someone came to your home area and said, ‘You go, I want to take your home and land for my own project?’ Would you like that if someone came and just moved you from your home, from your land? Would you like that? That is what is waiting us. What we know is we just have to wait and see what is going to happen with this river. If the government comes, they should just kill us, here, next to our river.